Right before school kicked in, we took a trip south to visit San Diego. 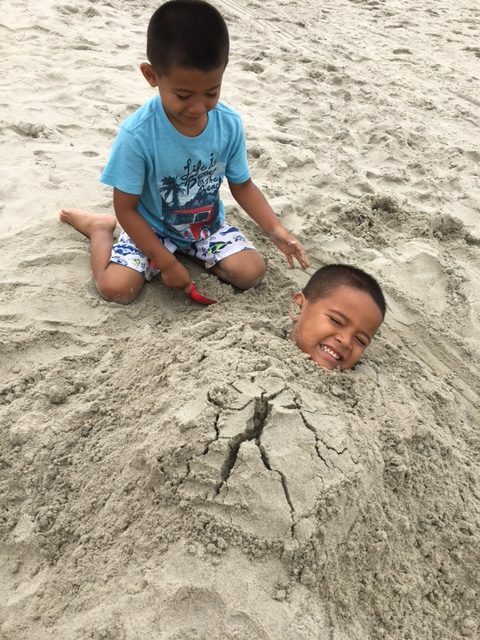 In 4 days and 3 nights we found some great spots to hang out with the kiddos, that were fun for the whole family! 1. 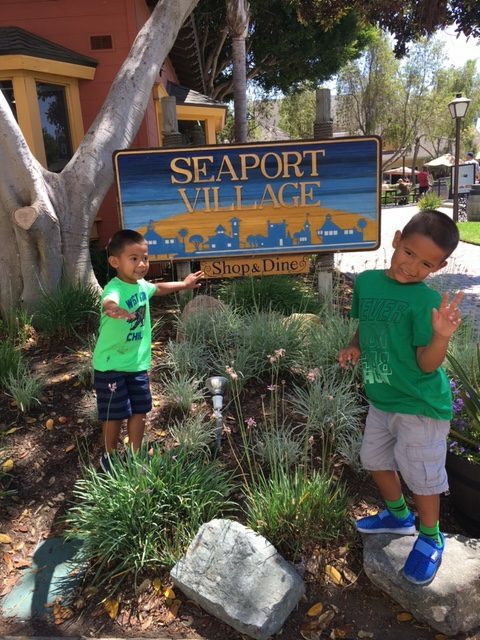 Seaport Village – Take a nice walk along the San Diego Bay and take in the beautiful views as you make your way along Harbor Drive to Seaport Village. We began our walk with brunch in the Gaslamp district before walking around Petco Park (home of the San Diego Padres), then toward the water and up to Seaport Village’s cute strip of shops and restaurants, centered around a gazebo where we ran into some live music and fun vibes. Keep walking north of Seaport Village and you’ll run into the USS Midway Museum at Navy Pier. 2. 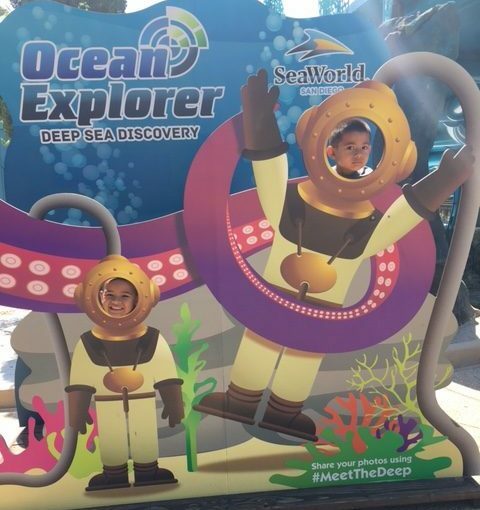 Sea World San Diego – It’s the perfect combination of sea life and thrill rides. The boys enjoyed several up close encounters with the animals, and also got their fix of amusement park rides. 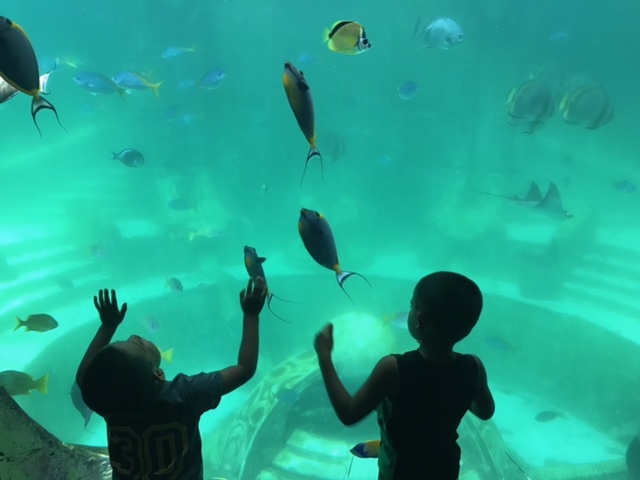 We went to the park on a Monday and while it was busier than we expected, wait times were easy and we covered the entire park and took in the dolphin show too. 3. Coronado Beach – Out of all my visits to San Diego over the years, one place I had yet to visit was Coronado Island, so I decided to make the short trek across the bridge to check out Coronado Beach. The sand is powdery fine and soft, it’s littered with gorgeous gold flecks. There’s a huge beach area before you get to the water and there’s plenty of room to play. 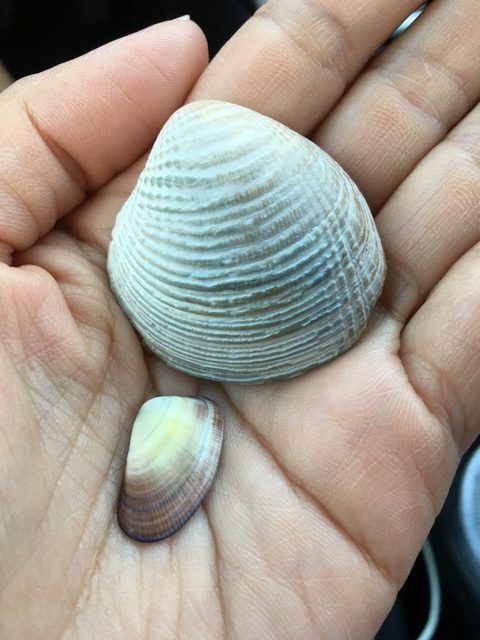 My children got a kick out of searching for seashells in the sand and the occasional navy air craft that would pass overhead. 4. Mission Valley – We stayed in the Mission Valley area where there are many options for accommodations. The location is central to so many places and was very convenient to downtown and the Gaslamp district, Mission Bay, Balboa Park and Old Town. There are many of the familiar strip mall stores and restaurants, and an open air shopping mall to hang out at too. 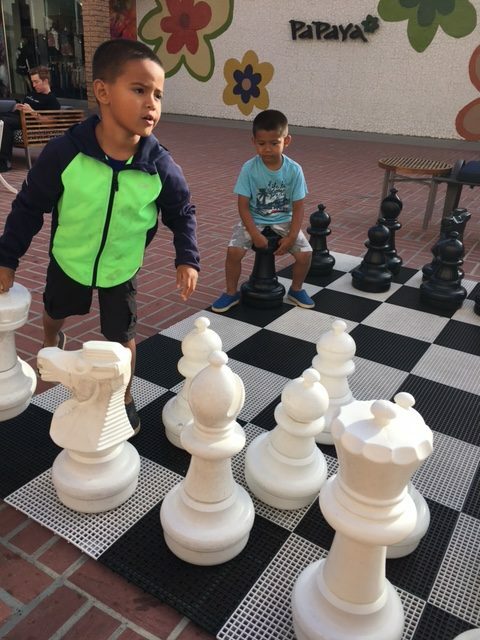 The boys couldn’t resist taking their turn at the lifesize chess board at the mall. 5. Mission Bay – Our last stop on this San Diego visit was to Mission Bay. We rented a surrey to check out the sights and rode it along the Bay. 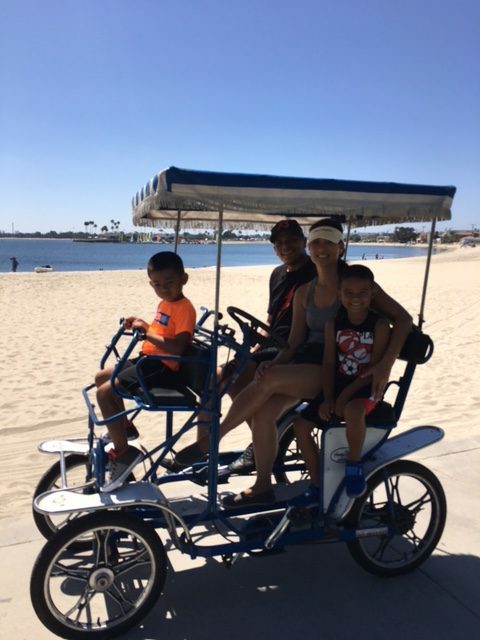 All that pedaling worked up our appetites, so we walked toward Mission Beach where we enjoyed yummy burgers at Coaster Bar & Grill. The grill is located right off Mission Beach and across from Belmont Park. Belmont Park has a fair number of amusement rides and fair food, plus a fun arcade for the kids to burn off some energy.